Jumeau antique dolls are coveted the world over. Jumeau bebes (child dolls) are known for their expressive eyes and beautiful bisque, and Jumeau French Fashion dolls are the perfect expression of their time and place. Jumeau dolls can sell for many thousands of dollars today, and demand for the dolls is quite high. The dolls were made in the second half of the 19th century during the heyday of French dollmaking by two generations of the Jumeau family. Pierre Francoise Jumeau began the Jumeau firm in the 1840s. At that time, they made papier mache dolls. By the end of the 1850s, they made porcelain (glazed) dolls, and for the rest of the firm's production thereafter, they specialized in dolls with bisque heads--first, poupees (fashion ladies) and then bebes (child dolls). Emile Louis Jumeau took over the firm in 1874, and the company remained in family hands until it was subsumed into SFBJ (see below) in 1899. As mentioned, in the early years Jumeau dolls were made of papier mache and then porcelain (commonly called China). These dolls are nearly impossible to identify as being from the Jumeau firm today since they are almost all unmarked. Starting in the 1860s, production moved to bisque doll heads (unglazed bisque) and most known Jumeau dolls were made of this. French Fashion dolls tend to have kid bodies, although some have wood or cloth, and bisque dolls generally have composition bodies. The dolls that put French dollmaking on the map were the French Fashion dolls, which were the most popular type of doll manufactured from the late 1850s through the 1870s. These dolls, also known as poupees, were lady dolls with womanly bodies and realistic clothing, shoes, hats, and accessories that reflected the fashion of their time. Jumeau was one of the best-known makers of these dolls, which were usurped in the late 1879s by the bebe (child) dolls. Although the French Fashion dolls made by Jumeau are beautiful, it is the bebes by this firm that are more widely known. 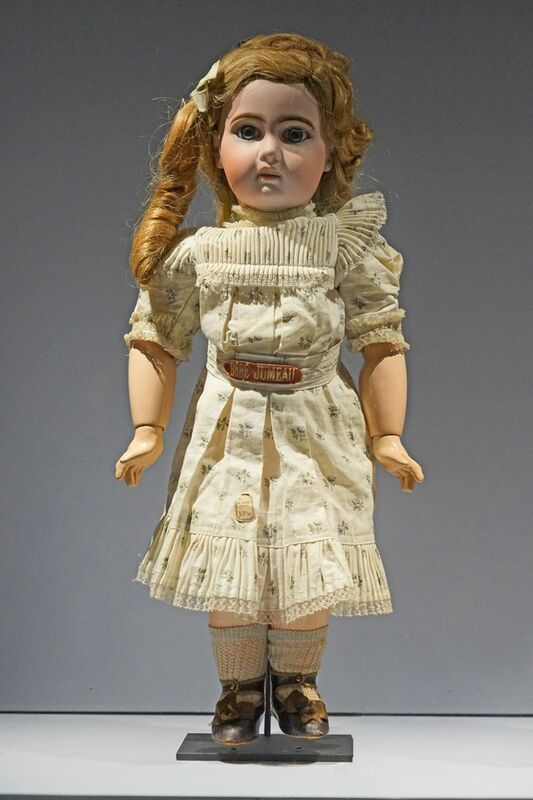 Made from the late 1870s when bebe dolls became the preferred doll of children everywhere, the dolls were made by Jumeau until they became part of SFBJ. The bebe dolls have bisque heads, paperweight glass eyes, exaggerated eyebrows, and beautiful bisque. Most had closed mouths until the 1890s. The French bebe, and Jumeau, met their demise due to cheaper German production. The French dollmakers, including Jumeau, were threatened by cheaper German production of bisque-head child dolls in the 1890s (think contemporary Chinese production vs US production). Eventually, the French firms could no longer compete, and in a last-ditch effort to survive, they combined forces as the Société Française de Fabrication de Bébés et Jouets. Most Jumeau fashion dolls are only marked with a number, although sometimes the body is stamped. Many of the Jumeau bebes take their colloquial names from their marks--the E.J. Jumeau is marked E. (size number) J on the back of the head; the Tete Jumeau is marked Depose Tete Jumeau on the back of the head. Often, you will see artist checkmarks as well, and a stamped composition body marked "Jumeau Medaille d'Or Paris" or something similar. The rarest Jumeau French Fashion dolls and bebes and those that have their original costumes and mint bodies continue to climb in price. More common dolls, including later open-mouth bebes and later French Fashion dolls with cloth or simple kid bodies and common faces, have had their prices stabilized in the last few years. However, expect to pay several thousand dollars for nearly any close-mouth bebe in excellent condition (collectors seem to prefer close-mouth antique bisque dolls to open-mouth ones). As of 2016, Jumeaus produced at the beginning of SFBJ production including those marked 1907 can be found for under $2,000. Some of the priciest Jumeau dolls include the early Portrait bisque bebe dolls which can easily be worth $20,000 to $30,000, and portrait-faced Jumeau poupees on wood bodies, which can be worth $10,000 to $20,000. Do You Know the Difference Between Bisque and Porcelain Dolls? What Are the Top 5 Antique Doll Brands From Germany?